Control Statements in katalon studio || loops and if else. 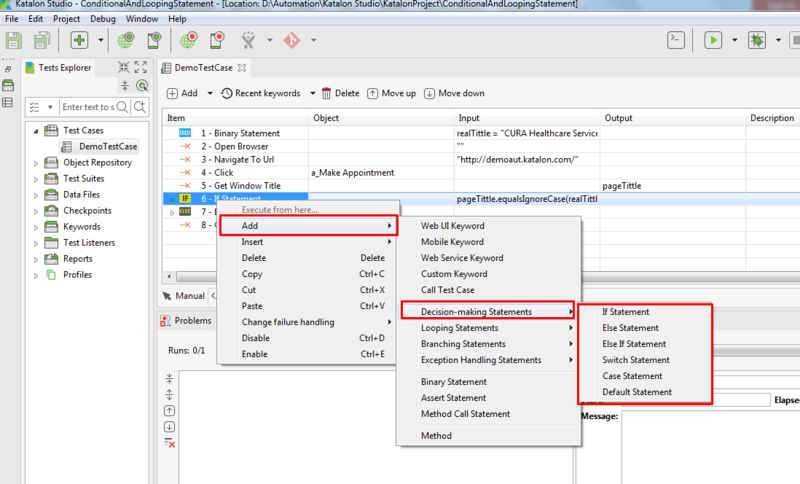 Control statements in katalon studio or decision making statements in katalon studio. Katalon studio providing very handy way to use statements like if, else, switch, loops etc. Control statements is very common if you have basic programming knowledge. Here I am not going to explain to you what is Control statements statement. We will focus on how to use Control statements in katalon studio. Control statement in katalon studio. Decision-making statements in katalon studio. Katalon studio provides manual and script both way to write your test cases. You can use manual way but if you have some basic knowledge about programming script will be easy for you. Complete script using if, else and switch in katalon studio. String realTittle = "CURA Healthcare Service"
Statement 1 is executed before the loop (the code block) starts. Statement 2 defines the condition for running the loop (the code block). Statement 3 is executed each time after the loop (the code block) has been executed. Complete script using for loop in katalon studio. //same testcase will execute three time. How to Create HTML report in katalon Studio.